Most young players naturally enjoy offense more than defense, but these simple tips and drills will have your team excited to defend. Coming off our 2017-18 Virginia state title, I have reflected on some of the things we did defensively that helped us achieve our success. Coaching in this era, where so much emphasis is placed on offensive development, players tend to no be that excited about playing defense. We spend a lot of time in our program stressing the importance of defense. Below I have provided some general ideas that we use to create player “buy-in” to our defensive concepts, as well as a few drills we run daily to create game like situations that reinforce our principles. 1. Utilize a defensive system that players enjoy playing. This can be a tough concept for some coaches to give in too. Most coaches have being running their defensive systems for years (if successful). With that said, we need to keep in mind the mindset of the athletes we coach of change and we must adapt to their mindset in order to reach potential. Any system can be successful, but the coach must sell his or her vision and excitement to the whole program. 2. Use competitive defensive drills. This is how you create the game like excitement of playing defense. The key is to create a situation where the winning team comes from executing and getting stops on defense. Check out the drills below for examples, and see how we keep track of scoring. 3. Hold players accountable for executing the major concepts of your defensive system. We use a variety of ways to accomplish this task. We film everything in our program during practices and games, and during film sessions we constantly show good and bad instances of executing. 4. Praise players every time they execute your major concepts on defense. This will have an effect on other players because they would want to get the same praise. Acknowledge when players execute a major defensive cornerstone successfully with some sort of comment or action. The diagram above is borrowed from fellow #TeamFastModel contributor, Coach Joel Hueser. Here the drill is shown being played 4v4, however we like to run it 5v5 to simulate a true game situation. 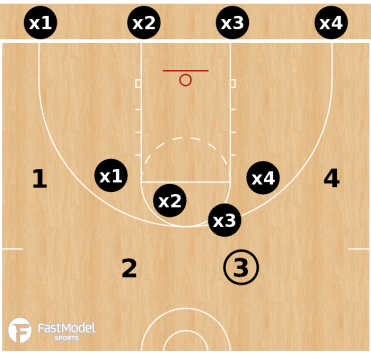 Purpose – To teach defensive concepts in a competitive, controlled half court setting. It can be expanded to work on full court concepts as well. Also a nice way to work on scouting report sets that translate to a game situation. Procedure – Offense starts with ball in an alignment of choice, and must successfully complete three passes before play is live. Once live, offense will then execute a particular offensive action looking to score. Defense will look to stop offense and complete the possession with a live ball turnover or rebound. We require our defense to get three perfect stops in a row in order to go on offense. We consider a perfect stop getting to help position, defending the ball, communicating and securing a rebound. If the offense shoots the ball and gets the rebound, the defensive score goes back to zero. 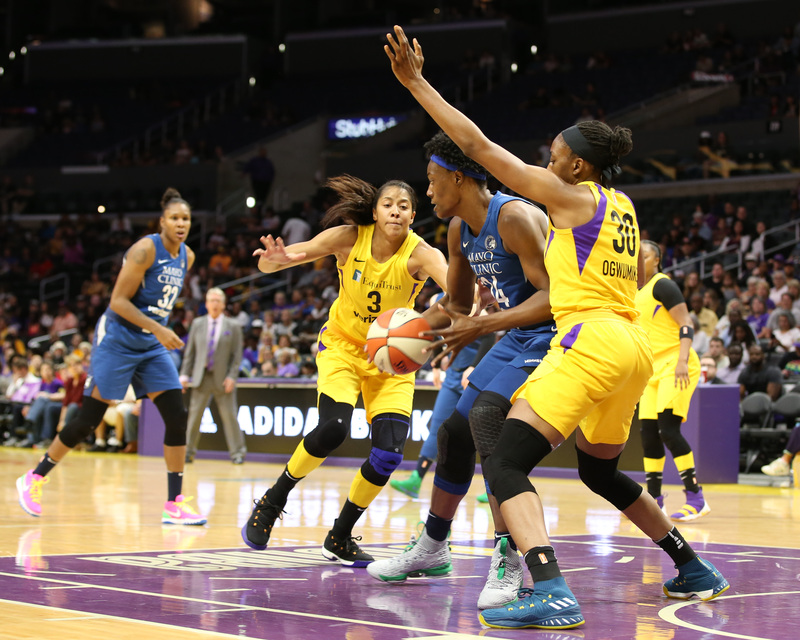 Coaching Points – Stress communication, proper help position relative to the balls location, pressure on the ball and contain and finish the possession by rebounding the missed shot. In order for defense to get off defense, they need to complete the sequence of: Stop + Score + Stop. Once the offense scores before the sequence is completed they go to defense. First team to complete the sequence wins. We like to play to 15 points, with the following scoring system: 2 points for a defensive stop, 2 points for a two point shot, and 3 points for a three point shot. The saying goes, “Defense Wins Championships.” This has worked for us, and hopefully it helps your team embrace to defensive side of the floor! If you have any questions about this drill or our defensive concepts, feel free to contact me at coachandrewlacey@gmail.com. You can also follow me on Twitter @Coach_Lacey5. - and don't forget to retweet to your followers!